Review of Harry Oelke, Wolfgang Kraus, et. al., eds., Martin Luthers “Judenschriften”. Die Rezeption im 19. und 20. Jahrhundert (Göttingen: Vandenhoeck & Ruprecht, 2016), 338 Pp. ISBN: 978-3-525-55789-1. On October 31, 1517, the irascible yet erudite German monk Martin Luther is said to have posted his Ninety-Five Theses on the door of the Castle Church in Wittenberg, touching off a massive theological and political controversy that has come to be known as the Protestant Reformation. Outside of this, his most famous exploit, Luther also (in conflict with the norm of clerical celibacy) married Katharina von Bora and translated the New Testament into German. Yet, it is his deeply antagonistic relationship with Jews and Judaism, as evidenced in his writings about them—the so-called “Judenschriften”—that, on the eve of the 500th anniversary of the events at Wittenberg, provoked the academic conference upon which the present volume is based. The volume is a product of the conference “The Reception of Luther’s ‘Judenschriften’ in the 19th and 20th Centuries,” which was held at Erlangen University in October 2014. The contributors, who number more than a dozen, represent fields that include Protestant church history, Protestant systematic theology, religion, Jewish studies, and Catholic theology. As the book’s title suggests, the collection of essays covers a broad chronological range; the thematic terrain is wide as well. This breadth is one of the volume’s greatest strengths. The essays addressing nineteenth-century reception of Luther’s Judenschriften are especially welcome, as are Christian Wiese’s insightful treatment of Jewish and antisemitic Luther lectures in the Kaiserreich and the Weimar Republic and Volker Leppin’s analysis of Luther’s Judenschriften in the light of the editions prior to 1933. Yet, there are some problematic elements as well, including some of the conclusions reached about Protestant reception of the Judenschriften during the Third Reich. These will be addressed (together with the volume’s strengths) after a summary of the contents. A thoughtful introduction by Harry Oelke sets out three elements addressed in the work: 1.) the volume’s “hermeneutical balance” between the original historical context of the Judenschriften and the history of their reception and impact in the era of the modern German state, 2.) the intention of the work, which is driven in part by the need to address historical lacunae on the reception history of the Judenschriften, and 3.) its conceptual structure. This structure consists of six parts. The first part, comprising two essays, provides a material overview of two fundamental areas of Luther research: the reformer’s life (Anselm Schubert) and his work (Volker Leppin). The second section deals with the reception of the Judenschriften in the era from the Restoration (or, the Vormärz) to the end of the Kaiserreich. Martin Friedrich addresses the theme of “Luther and the Jews” in Prussia until 1869, while Hanns Christof Brennecke deals with the reception of the Judenschriften in the era of the Erweckungsbewegung and Bavarian Confessionalism. Christian Wiese examines the interplay between Jewish interpretations of Luther and antisemitic reception of the Judenschriften in the Kaiserreich and the Weimar Republic. In the third section of the volume, the thorny issue of Protestant reception of Luther’s Judenschriften during the Weimar Republic and the Third Reich is addressed. Gury Schneider-Ludorff’s essay analyzes the theme “Luther and the Jews” in its theological perspective in the era between the two World Wars. Essays on reception of the Judenschriften in the Confessing Church (Siegfried Hermle) and in the German Christian movement (Oliver Arnhold) follow. The fourth section of the book examines German Protestant discourse on the Judenschriften in the era following the Second World War. The reception of the Judenschriften in the field of church history is examined by Harry Oelke, while Reiner Anselm analyzes the theme in ethics and systematic theology. A third essay by Stephen G. Burnett addresses the reception of the Judenschriften in the Anglo-American context; Burnett reminds us that these writings did not become an issue in this context until the second half of the twentieth century. In the penultimate section of the book, the lens is widened to include Catholic and international ecumenical contexts. Lucia Scherzberg examines Catholic perceptions of “Luther and the Jews” while Wolfgang Kraus analyzes the theme as it has been addressed in official church pronouncements since the Second World War. The final section of the book features two thought-provoking summary analyses of the conference proceedings and the volume (Berndt Hamm and Johannes Heil). Several essays stand out for their contributions to the history of the impact of Luther’s Judenschriften in modern German history. Volker Leppin’s essay is especially valuable. It demonstrates, through fastidious attention to detail, that the Judenschriften appeared as part of collected editions of the reformer’s broader work and in individual editions alike from the sixteenth century to the twentieth. Notably, Leppin corrects the faulty notion forwarded by some twentieth-century German church historians that Luther’s Judenschriften somehow were not readily available to German Protestants during Weimar and the Third Reich. Leppin’s conclusion is clear and emphatic: “What effect Luther’s Jewish writings actually had on the adaptation of antisemitic racism in ecclesiastical circles cannot be decided on the basis of the editorial position. But this much is clear: the texts were available at any time—even on the eve of the Third Reich” (37). He provides a trove of evidence to this effect, including a list of dozens of primary sources that demonstrate the point. Thus, the Judenschriften were most certainly read by many German Protestants from the 1920s to the 1940s. Christian Wiese’s incisive essay on Jewish and antisemitic Luther lectures during the Kaiserreich and the Weimar Republic demonstrates that Jewish scholars working in the early twentieth century—Hermann Cohen and Leo Baeck are placed at the center of Wiese’s analysis—offered, yes, a historical critique of those aspects of Luther’s theology that were hostile to Jews and Judaism, but also a picture of the reformer as a “symbolic embodiment of a tradition of tolerance and emancipation” (110) (i.e., an embodiment of those elements of the Enlightenment tradition that were not only laudable but vital to Jewish life in the public square). Jewish intellectuals, who “were looking for positive links to the central figure of the Reformation so central to the German-Protestant cultural consciousness,” thus forwarded an image of Luther that would enable them to integrate more fully into German culture and society (119-120). Tragically, this portrait of the reformer “was almost completely ignored by contemporary Protestantism and remained therefore tragically ineffective” (110). Berndt Hamm’s summarizing analysis of the volume’s content is both thoughtful and, in places, problematic. Hamm highlights and expounds upon eight salient points raised in the conference and the volume. While taken together, they are all relevant and meaningful; a few, in particular, are worth examining closely. The first point reads, “Luther’s Judenschriften are evidently both present and not present in the nineteenth and twentieth centuries.” As the volume’s essays demonstrate, there certainly are periods during which, and pockets of German society in which, the Judenschriften are less present than one might expect, including in the work of some Jewish intellectuals during the nineteenth century. Yet, they are more present in the Confessing Church during the Third Reich than either Hamm or Siegfried Hermle would have us believe. While the virulence of the application of Luther’s recommendations to, for example, burn down Jewish synagogues and confiscate sacred Jewish writings is certainly more pronounced and vulgar in the writings of the radical German Christian wing of the Protestant church, the generally more urbane application of Luther’s anti-Jewish recommendations is more than “hardly” present (315) in the writings of Confessing Church figures. There is also little recognition here of the fluid Protestant “middle” or “neutrals,” who represented roughly a third of the German Protestant clergy during the Third Reich. Hamm’s third point is especially valuable. He notes that, until fairly recently, scholarly research on the Protestant Reformation and Luther has not emphasized enough the “theological connections between the aggressive exasperation in Luther’s late Judenschriften and the apocalyptic-anti-satanic fundamental character of his theology since 1520 …”, which included, for example, his view of the pope as the antichrist (317-318). The Dutch Reformed church historian Heiko A. Oberman was the first to make this important observation, which was a crucial step toward Protestant Reformation and Luther scholars more directly recognizing and confronting the antisemitism in Luther’s works. The fifth point contains both cogent analysis and a very curious conclusion. Here, Hamm confronts the prickly problem of the terminology that should be employed when discussing hostility and hatred toward Jews and Judaism. In other words, should scholars use the term “anti-Judaism” or “antisemitism”—or, perhaps, both? Or, a different term altogether? Kyle Jantzen reflected on this problem in a previous issue of CCHQ. The present author also discussed it (Probst, Demonizing the Jews). Hamm rightly notes that the term “antisemitism” is, in a sense, absurd, because, in its application it always refers not to hatred toward Semites more broadly, but to Jews. In the late nineteenth century, when the term was coined by Wilhelm Marr, antisemites connected language and culture to race, resulting in a term that, ironically, sounded “respectable” to these less vulgar (but still no less hateful) proponents of anti-Jewish animus. In modern scholarship, “the term ‘antisemitism’ has now been established in such a way that it defines a judenfeindlich attitude [an attitude of hostility toward Jews] which socially excluded and legally disadvantaged members of the Jewish religion or their descendants, or at least intended such exclusion” (319). Because Luther (and others) often used theological or religious arguments to denigrate Jews and Judaism, many scholars, including many church historians, have argued that Luther was “only” engaging in anti-Judaic thought, not antisemitic agitation. Hamm acknowledges this problem. Yet, curiously, he suggests as a solution—one that he rues as “unrealistic”—that scholars “renounce the linguistically misleading concept of antisemitism and replace it in general with the concept of anti-Judaism” (320). The problem of terminology is indeed very real. But, as the term “antisemitism” was originally meant to signify hatred of Jews on the basis of their race while “anti-Judaism” has predominantly been used to connect anti-Jewish hatred to religion, it is likely that neither term will satisfy those examining the issue in a scholarly fashion. It is also true that understanding the precise motivations for anti-Jewish hatred—while valuable to scholars and laypersons alike—is cold comfort to the historical victims of such hatred. While discussing his seventh point, Hamm opines that Luther’s Judenschriften “did not produce this new racial-biological antisemitism” and that the Nazi regime carried out the mass murder of millions of Europe’s Jews “without any argumentative support from the authority of Luther.” In short, so Hamm, “For the masterminds of the crimes, Luther’s writings on the Jews were only a completely marginal aspect.” This logic is problematic on more than one level. First, here as elsewhere, Hamm reduces Nazi antisemitism to its “racial-biological” variety. For two decades, Burleigh and Wippermann’s thesis about the Nazi “racial state” has largely held as the most accurate characterization of what the Nazis created in Germany. Yet, Alon Confino argued convincingly in A World Without Jews: The Nazi Imagination from Persecution to Genocide that the Nazis imagined a world in which the very memory of Jewish existence, including their culture and religion, would be eradicated. This is why Nazis burned Hebrew Bibles and synagogues in November 1938. If Confino is correct, then the starkest aspects of Luther’s antisemitism, including, but not limited to, the burning down of synagogues and the confiscation of the sacred writings of Judaism provided for many German Protestants a vision of the world that had affinities with the one envisioned by the Nazi regime. This is something more than merely the “disturbing parallelism” suggested by Hamm (321). Did the Nazis base their murderous plans for the Jews of Europe on Luther? No. But, did the Nazis need the support of Protestants, who represented roughly sixty percent of the German population, not only to gain and retain power, but also to lend, together with other vaunted cultural institutions, a certain moral legitimacy to their repression of Jews and other persecuted groups? Actually, in important ways, they did (Ericksen, Complicity in the Holocaust: Churches and Universities in Nazi Germany). It is also important to recognize, as Leppin’s essay demonstrates, that Luther’s Judenschriften were readily available in numerous editions to German Protestants during the Third Reich. Further, a significant number of German Protestant pastors, theologians, and Luther scholars—including, for example, Erich Vogelsang, Wolf Meyer-Erlach, Georg Buchwald, and Walter Holsten—interacted in significant ways with the Judenschriften in their published work (Probst, Demonizing the Jews). 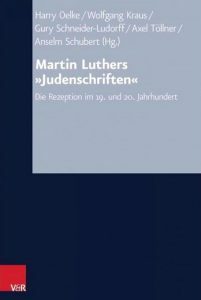 Luther’s writings about Jews and Judaism were certainly not the driving force behind Nazism and the Holocaust. But, they were no small part of the German Protestant cultural milieu. The strengths of the present volume include its chronological and thematic depth and its inclusion of scholars working outside the boundaries of German Protestantism, namely, scholars working in Catholic theology and Jewish studies. Given its weaknesses, it will no doubt engender debate among lay readers, but perhaps especially among Luther, Reformation, and Holocaust historians.